The Afghanistan Cricket Team is a force to be reckoned with. The recent member of the Test playing nations group, Afghanistan has taken giant strides in world cricket since its debut as a World Cup participant during the 2015 edition. Recently winning the ICC Cricket World Cup Qualifier in Zimbabwe by defeating the inaugural world champions The West Indies. The war-torn country is recently on the verge of a World Cup fairytale. But the question is can Afghanistan replicate what Kenya did during the 2003 world cup? 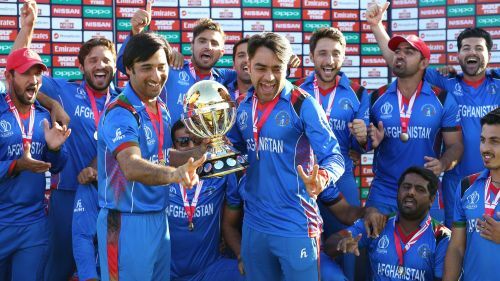 By virtue of some high-class performances during recent times, the Afghan cricket team can be regarded as the underdogs in the upcoming World Cup. The team had a brilliant Asia Cup, in which they had almost defeated the mighty Indians but the match was drawn later. Another surprise was a one-sided affair against the former world champions, Sri Lanka, as they crushed them by 91 runs. The main factor which makes them versatile is the presence of star performers in their roster. Rashid Khan, widely known as the poster boy of Afghan cricket ranks second and first in the ICC rankings in the ODIs and T20Is respectively. His performance of 7/18 against the West Indies was an eye opener for many cricket pundits all around the world. The services of Mohammad Shahzad at the top of the order gives the middle order batsmen a great platform to build up a high score. Shahzad was the top scorer in the thriller against India, making 124 from 116 balls. During the recently concluded Afghanistan Ireland series, the Afghanistan team broke the world record of highest team score in T20 cricket. The score read 278-3 which was largely possible due to Hazratullah Zazai, who scored 162 from just 62 balls. Also to be noted, Rashid Khan became the first bowler to take four wickets in four balls in a T20I. Another rising star is Mujeeb Ur Rahman who is the first male to play international cricket being born in this century. He has represented the Kings XI Punjab in the IPL and the Brisbane Heat in the BBL. Speaking of performances, the team has a good balance of top-order batsmen, all-rounders, and bowlers. The skipper Asghar Afghan has to lead the team from the front and the players have the experience of playing international leagues. After a clean sweep of the T20I series, the Afghans have taken a lead in the ODI series as well. Mohammad Nabi, the veteran who has been playing T20 cricket since 2010, has been part of the rise of the Afghanistan cricket. Starting from the narrow streets of Loger to the huge Marvel Stadium in Melbourne, he has conquered them all. Nabi is the first Afghan to play in the IPL but the seeds of greatness were sown in 2009, where he took 11 wickets 2009 ICC World Cricket League Division Three, due to which Afghanistan was able to qualify for the 2009 ICC World Cup Qualifier and hence Afghanistan had gained the ODI status. The pace attack of the team is lead by Dawlat Zadran, who is a hard working bowler and he is able to click the 140+ kmph mark regularly and the most savage fact about him was he had smashed four sixes in seven balls against Zimbabwe in 2014, well he is not the worst tailender though! Talking about impact players Mujeeb is no surprise, learning the spin techniques from youtube by watching the videos of Ajantha Mendis, he became a star overnight as he played a vital role in decimating the Bangladesh team by 3-1 in their own backyard. In the Afghan team, The role of the aggressor is played by Shapoor Zadran, he hits the deck hard, his debut figures of 4-24 speaks about his efforts. Hailing from a war-torn country, most of the players had to shift to Pakistan for better options. Initially, they were not able to leave a mark on the subdivisional tours, but now due to the exposure and experience provided by the T20 leagues around the world, they developed the skills to play according to the situations. They had a horrible debut in the 2015 ICC World Cup as they were trashed by each and every opponent except Scotland. However, this was more like an eye-opener as the Afghan players made a mark in every league they went. The success critics speak is the result of hard work and exposure they experienced playing across the world in the different T20 leagues. Now, they have their own T20 league named Afghanistan Premier League consisting of 5 teams and many players across the globe. The inaugural champions are the Balkh Legends captained by Mohammad Nabi. This league can be another turning point in the history of Afghanistan Cricket as this can lead to huge income for the Board, which will result in more talents for the Afghanistan Cricket Team. The most special and awe-inspiring fact about this team is in spite of having minimum facilities and no scope for training back home, they lived their dream and the war against terrorism back home did not create a roadblock to their success. They were able to learn cricket in difficult situations, most of their players have learned cricket in Pakistani refugee camps before eventually coming into the international stage. Rashid Khan had learned cricket by studying the techniques from Sachin and Afridi online after which he practiced using a tennis ball. Hence these men are like a silver lining in the dark clouds for the children back home as they considered as heroes due to their strong mindset and determination level. Now, after all these magical performances head coach Phil Simmons and his boys will look to weave more magic in the cricketing world. It is very much possible that this Afghan team can replicate the Kenyans did in the 2003 World cup. This success will bring on a revolution back home, the children will start believing in themselves and will do wonders for both their country and the cricketing world.